And sentences. Sometimes even fully formed paragraphs to describe what we're thinking about, or have thought about, or have put no thought into at all. This is the internet after all. Little Lunch has been nominated for an International Emmy! Very excited to learn about this announcement overnight from MIPCOM in Cannes. 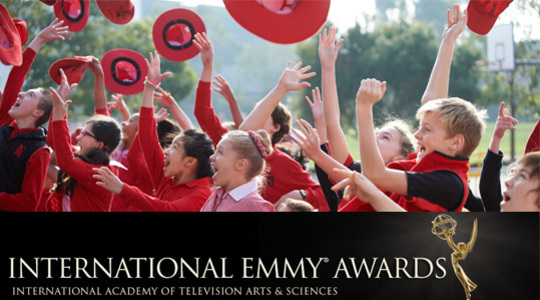 The Little Lunch special, The Nightmare Before Graduation has been nominated for an award in the Kids: TV Movie/Mini-Series section of the International Emmy Awards Kids. Executive Assistant needed in our stable. Gristmill is on the hunt for an Executive Assistant for the incredibly needy Robyn Butler and the very demanding Wayne Hope so if you think you are the completely amazing human being we need who can make us happy and bring peace everywhere - fine, just the make us happy bit - then we cannot wait to hear from you. Little Lunch Specials - now an iBook! We have released the scripts for both The Halloween Horror Story and The Nightmare before Graduation an iBook! All your favourite lines from these two half hour Little Lunch Specials mixed with loads of on-set photos and video galleries. Ever felt like you should be reading more but just love watching TV instead? Here's the perfect compromise. Delighted to learn that our Little Lunch Special: The Nightmare Before Graduation has won Gold (Best Child’s) & Best in Festival at the 50th US International Film & Video Festival. In her first foray into directing, Robyn has smacked it out of the park and won the 2017 Australian Director’s Guild Award for Best Direction in a Children’s TV or SVOD Drama for the Nightmare Before Graduation Little Lunch Special episode. Thrilled to hear that The Halloween Horror Story and the Nightmare Before Graduation episodes have won the 2017 Bronze and Gold Houston Worldfest Remi. Super proud of our Little Lunch Special - The Nightmare Before Graduation which picked up the 2017 Logie award for Most Outstanding Children’s Series.